I love updating my home decor. I am forever moving and changing things around. (Thanks mom… Wink Wink.) But my favorite updates are the ones that literally take 5 minutes, and not much thought. Can I get an Amen. I had some leftover magnolia leaves from a floral arrangement that were starting to dry out and I was loving the golden brown color. I couldn’t bare throwing them out, so instead of buying yet another wreath to go with the changing seasons, I thought I would just change out my ribbon and add in some of the golden dried magnolia leaves to my current wreath and viola, an autumn wreath for this fall!!!! All you need is some floral wire, wire cutters and ribbon of your choice. You can dry any leaves you may have in your yard for color, I don’t have a magnolia tree, but maybe a neighbor does and they wouldn’t mind a missing branch… Otherwise you can grab lots of different varieties of fall colored leaves from a local florist. 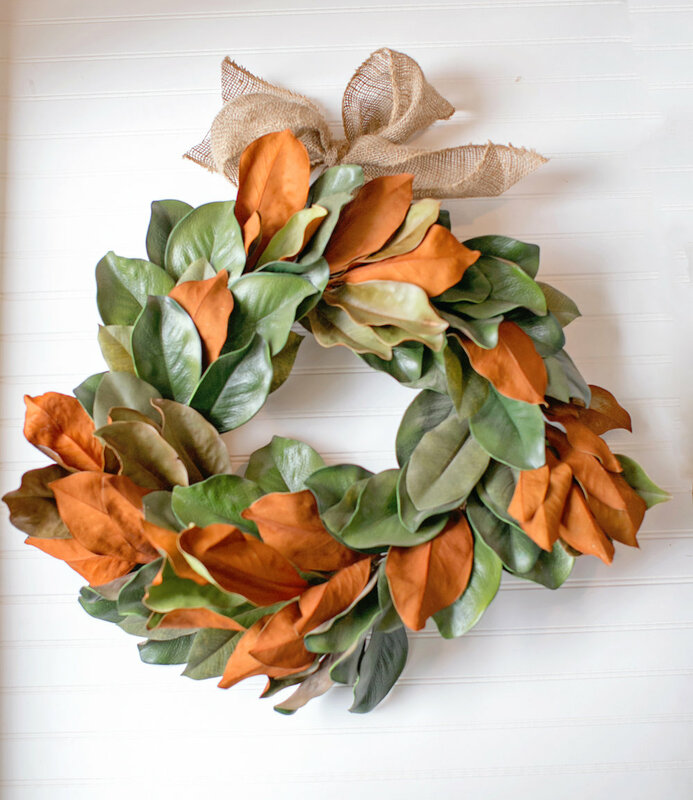 Ok, now that your ready, just place the leaves around your wreath to fill in color and use the floral wire to attach them. Change out your hanging ribbon and your project is complete! Have fun being creative and adding some fall color to your decor.